Brickell is one of Miami's leading neighborhoods for new development and luxury condominium living. Located just South of Downtown, Brickell is admidst the city's financial district and is just south of Downtown. It is fifteen minutes from South Beach and fifteen minutes from Coconut Grove and offers some of the most cutting edge dining in the city. Many young professionals choose to live in Brickell and it has a thriving pedestrian community. Some of the most important new developments in Miami are in the Brickell neighborhood. There are currently 14 new developments that range in starting price. One of the most exciting new developments is the Brickell Flatiron and Beachfront is pleased to visit and explore this new property and offer our insights. 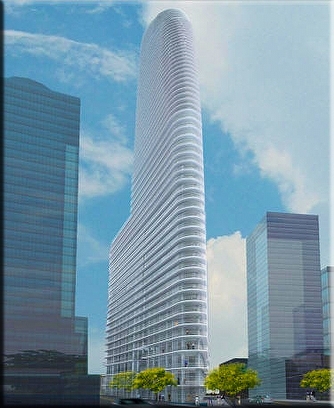 Brickell Flatiron is located at 1001 South Miami Ave and is developed by Ugo Columbo. It will have 552 residences within 65 floors. It is modeled after the Flatiron in New York and is completely cutting edge. In terms of amenities, it offers a rooftop pool, spa, and fitness center, combining the latest therapeutic services and sauna facilities with the highest grade of exercise equipment and specialty rooms. It has a focus on awareness and has Wi-FI throughout the building including outdoor amenities thanks in part to a fiber optic building backbone. It has integrated digital concierge service and twenty four hour surveillance nad valet. Residence features include miele applliance packages, italian custom Snaidero cabinetry, Bosch washers and driers, eliptical balconies, high ceilings, custom italian doors, and enhanced soundproofing. Residences are available in 8 diffferent floorplans. For more information on Brickell Flatiron, please contact a member of Beachfront Today!